Preheat oven to 350°. Cut greens off beets, leaving 2″ of the stalks attached to beets. 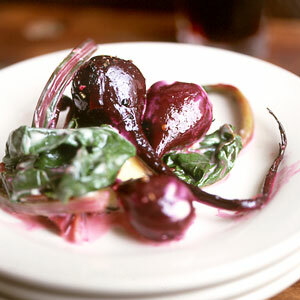 Wash greens and beets and set aside separately. Roast beets in oven (using method at right) until soft, about 1 hour. Unwrap beets and set aside to cool, then peel. Meanwhile, cook beet greens in a medium pot of boiling salted water over high heat until tender, about 5 minutes. Drain, squeezing out excess water, and put into a bowl. Toss with extra-virgin olive oil and salt and pepper to taste. Set aside to cool. To serve, spoon some of the aïoli (recipe below) onto 4 small plates, then divide greens and beets between plates, putting greens on top of aïoli and beets on top of greens. Season to taste with salt and pepper. Put garlic, mustard, and 1 tsp. 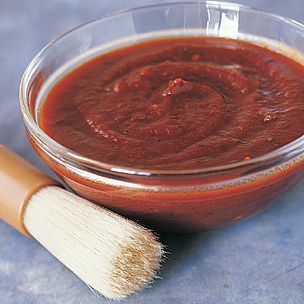 salt into a medium bowl and use the back of a wooden spoon to crush them into a paste. Add egg yolk and whisk until pale. Add lemon juice and whisk until frothy. Gradually add vegetable oil, and olive oil, in slow steady streams, whisking constantly, until oils are incorporated and mixture is emulsified. Adjust seasonings.